One of my sisters is married to a man from India. She cooks some killer Indian food. This recipe is one of hers and it is good. The Spicy Indian Chicken Sandwich is a fun change from a regular grilled or pan cooked chicken sandwich and has a nice kick. Adjust the spice depending on your family’s heat tolerance. My family can’t take things near are spicy as my sister and those she cooks for. 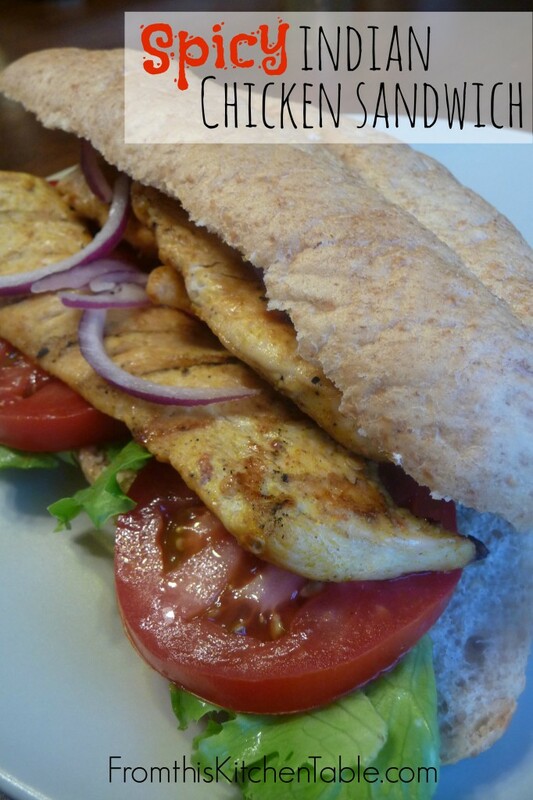 On top of the heat in this chicken, she recommends topping the sandwich with sliced raw jalapeno. There is no way my mouth could handle that, but if you like fire, go for it! You can thinly slice the chicken breast and cook on the grill or cut into bite sized piece and cook over the stove. Top with lettuce, tomatoes, and thinly sliced red onion. 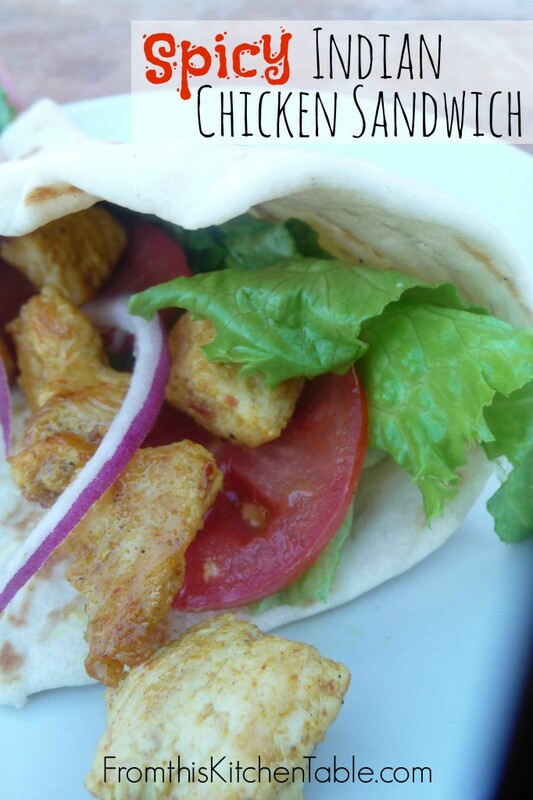 Serve on a bun or in a piece of naan as a tasty wrap. This will serve 6-8 depending on how large your chicken breasts are. Combine all ingredients except for chicken. Rub spice mixture over chicken and let marinate at least four hours and preferably overnight. Cook the thinly sliced pieces of chicken on a low grill being careful not to overcook or saute the chunks in a small amount of oil on the stove. Build your sandwich or wrap with your choice of bread and toppings. This entry was posted in Main Dish, Recipes on March 21, 2014 by Deanna Michaels. It is fabulous! I hope you enjoy it. thanks for stopping by! Thanks for sharing this great recipe with us. So lovely to “meet you” through Rosilind’s A Little R and R linkup today! Thank you for stopping by, Lyli, and commenting! It really is a tasty recipe. Has great flavor. Spicy Indian food!! How could I not check this out?!?! So glad I decided to look at this one. I will definitely have to try it out. We’re gluten free, so I’ll probably just put it on a rice cracker with a slice of tomato. YUM! It is super good! Oh, love your idea of using a rice cracker. I think it would be tasty as a salad too. We are wheat free for a 5 week experiment to see if it helps with my little guys eczema, so I’m having to do things a little differently right now. I would definitely try this…I love spicy food and Indian food is one of my favorites! Where do you find sambal oelek? I’ve never heard of that spice. I love Indian food as well. So tasty! I buy my sambal oelek at the asian store in the little bit bigger city an hour and half way. Grocery stores in bigger cities sometimes carry it as well in the Asian aisle. G’day! Looks delicious Deanna! I could go for one of these right now! It is such a flavorful sandwich! So tasty and a little different. These sandwiches look delicious. We can take foods that are too spicy either, but I think I will be giving this recipe a try. Pinning it for later. Thanks, Shelly! They are easy and tasty. Love that they have just a little bit of a different twist. I hear you! No way I could handle the raw jalapeno on it. Hope you guys enjoy them. It is so tasty! I hope that you enjoy it as much as we do. Oh my goodness! Thanks you for giving me the laugh of my day. How in the world have I not noticed that??? (Or why has no one else said something?) Thank you SO much for letting me know. Now to figure out how to fix it without messing up links. . .